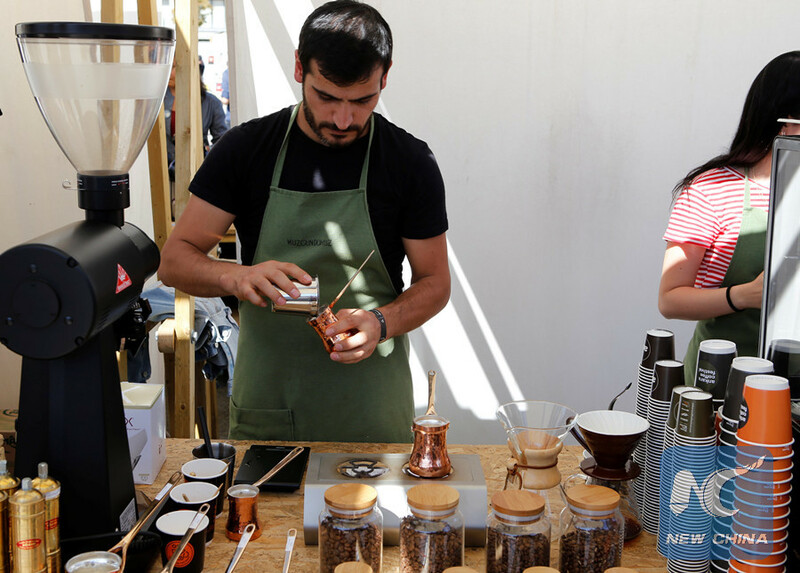 Feature: What's brewing at the Ankara Coffee Festival? 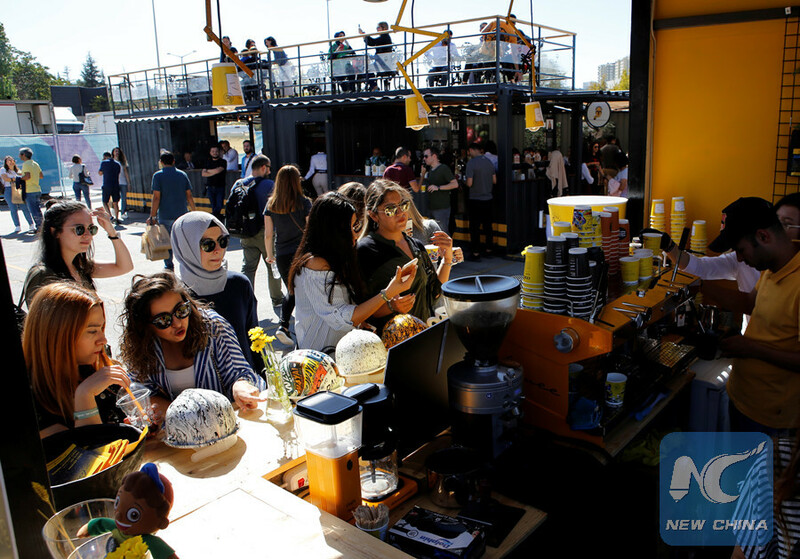 ANKARA, Sept. 30 (Xinhua) -- Thousands of coffee lovers flocked to the three-day Ankara Coffee Festival in Turkey, the land of the Turkish coffee, for a cup of the increasingly popular hot or cold beverage, an event blending traditional and modern culture. In Turkey coffee is more than a drink. It is often drunk in small coffee shops. While the drinks are tiny and the coffee is strong, it is meant for sipping and lingering, for conversation, even for telling fortunes from the coffee grounds left in the cup. That coffee tradition dates back to the 14th century and has since entrenches itself in the popular culture. Since the start of the new millennium, leading international coffee brands from around the world have opened many shops across Turkey's cities luring customers to new tastes and brewing techniques. 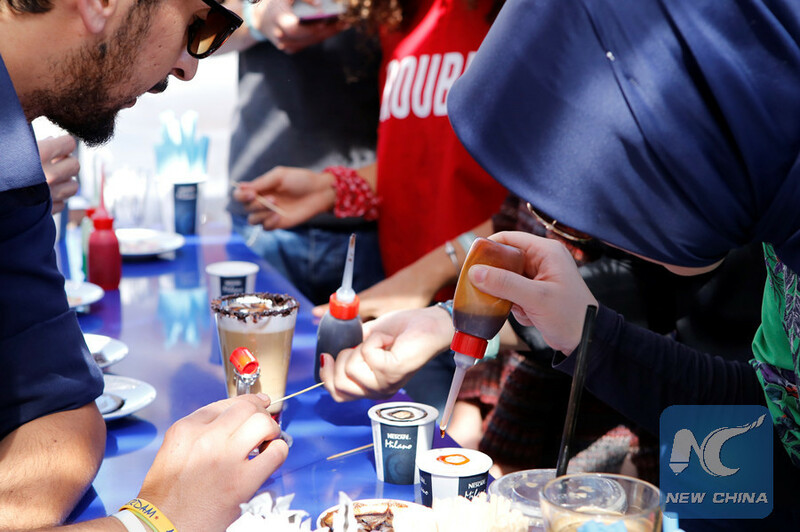 The third annual Ankara Coffee Festival brings together the leading brands and tastes of the coffee trend, professional baristas from the region, design products, live music performances and seminars and workshops. "I can't do without a cup of filter coffee in the morning, I study better when I have my coffee fix in the morning," a university student who names himself Deniz told Xinhua. Nowadays you can find both Turkish coffee and various tastes of coffee, African, Asian, American or South American in many coffee shops, big or boutique ones. "My parents are very fond of Turkish coffee which is too strong to my taste and I don't have the time to sit down and linger around so in the morning or after a good meal I go to a Starbucks or another shop to have a large coffee," said Turgut Yucel, an employee of a technology company in the Ankara suburb. He said at the festival he learned brewing techniques from experienced baristas. "I am learning to teach my palate so it will get acquainted to the many different coffee variations of the planet. I am now much more aware of what I am drinking." As coffee drinkers increase in Turkey, where tea drinkers still dominate by far, organizers of the Ankara event are keen to present "a unique experience to coffee lovers." "Coffee culture is on the rise in our country among the young generation, so we are bringing them new flavors and aroma and bald to host thousands of coffee lovers," said Ayhan Aytekin, the director of the Bilkent Center shopping mall which hosted the festival. The festival organized by Dream Sales Machine kicked off Friday and features 90 brands. Around 8,000 coffee lovers attended the 2016 event, while the festival hosted over 15.000 visitors in 2017. Perhaps the most crowded stand was the one of the famous Turkish brand, Kurukahveci Mehmet Efendi, meaning Turkish coffee by Mehmet Efendi, which has been roasting coffee since 1871. Today it has become the biggest and the oldest coffee company in Turkey and is highly recommended by consumers in Turkey and also abroad where it's fame is undisputed. "People have the impression that we produce only Turkish coffee which is not true. In the early 1930s, we were roasting beans for espresso or filter coffee for mostly our foreign clientele in Istanbul," explained Melih Karagul who is in charge of the quality branch at the company. "We export Turkish coffee to 55 countries abroad but we are not only a Turkish coffee producer and retailer," he said. The festival is also an opportunity for small businesses to showcase their passion and their knowledge of coffee to consumers. Many young male and female baristas served freshly brewed coffee to a curious crowd. The event also hosted a number of interactive workshops, panel sessions, live concerts, art exhibitions with design products and food related to coffee so that visitors would get the latest updates on coffee and lifestyle trends.